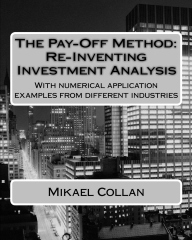 This is the first book on the pay-off method and the application of the method in a real world setting. The book is managerially written and includes a number of numerical examples of how the method can be used in the industry. Available at the Createspace on-line bookstore or at Amazon. Errata: Observe that figure 3 in the published journal paper has an error; the real option value is incorrect – the correct ROV for the project is 7,96. The figure is correctly reproduced on the pay-off method page. Based on the logic presented at the Pay-off method we are working on extending the model to use credibility theory. Paper on a credibilistic approach to the pay-off method. This is an extension of the method into the realm of credibility theory.